I'm often asked, "Do we need to make all our hotel reservations in advance for New England's fall foliage season?" It depends where and when you travel, and what sort of accommodations you prefer. New England's fall foliage season, when its forests display blazes of leaf color, depends on summer and autumn rainfall, temperatures, and other climatic factors, so it's impossible to predict in advance when the fall foliage color may "peak" (be at its most brilliant) in any particular area. During "peak season," particularly on weekends, and especially on the 3-day Columbus Day holiday weekend, New England hotels, motels, inns and B&Bs will be most heavily booked. 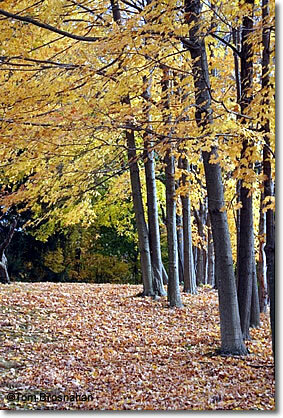 Fall foliage color begins in the higher elevations and cooler clime of northern New England, usually about mid-September, and spreads southward, reaching the coastline and islands of Massachusetts, Rhode Island and Connecticut in late October. Pockets of color may last well into November in protected valleys. 1. Plan to be in resort areas (mountains, lakes, seacoast) during the week (Sunday through Thursday nights), and towns and cities on weekends (Friday and Saturday nights). Prices will be lower and crowds smaller this way. 2. Avoid touring on Columbus Day weekend, as that is the busiest time of all for foliage-watchers. Some accommodations, especially inns, may require a 2-night minimum stay. If you avoid touring in the countryside on any weekend in late September through mid-October, you'll have a much easier time finding exactly the accommodation and price you want. 3. Consider all types of accommodations. Many foliage-seekers prefer the charming accommodations of a New England country inn or bed-and-breakfast guest house, but if you leave yourself open to staying at roadside motels or city hotels, you'll find more rooms available at a wider range of prices. 4. Carry lodging directories or an Internet device with which you can research possible lodgings at least a day in advance. Northern New England is not as densely populated as the south, so you need to learn if there are even beds where you might want to sleep! 5. Use your mobile phone to call ahead from the road to check for vacancies and room rates. 6. Don't wait until the end of the day to find your bed. Have some idea where you'll stay by mid-afternoon at the latest (earlier if possible), and call ahead to learn about the lodging situation. This is particularly important on Fridays as lodgings may fill up for the weekend. After a few days' travel, you'll get a "sense of the market," and whether or not you'll have to make more reservations in advance. Fall foliage in Concord MA.